How Did the Wildlife Cross the Road? Biologists study road ecology to reduce harmful effects of highways on animals. When Paul Hanson set up his first game camera in the Franklin Mountains of El Paso, he wasn’t sure what he’d get. He was thrilled when a mountain lion — rarely seen because of the animal’s secretive nature — showed up. Eight months later, a heartbroken Hanson learned that the mountain lion was found fatally injured by the side of Transmountain Road, the victim of a collision with a car. “I was devastated. We knew it was the same one because it had a really distinguished nick in its ear,” says Hanson, who works for TPWD’s Wyler Aerial Tramway. At the same time, on the other side of the Franklins, the Texas Department of Transportation was busy building a wildlife and pedestrian underpass on Transmountain to enable the safe passage of animals and people in the mountains. Like many roads across the state, Transmountain Road has created seen and unseen effects on wildlife and the surrounding environment. Roads can act as barriers to animal movement, create fragmented habitat, limit access to resources and divide wildlife populations into more vulnerable subpopulations. They can, of course, also cause roadkill. The emerging field of road ecology aims to address these problems. Several U.S. states have begun implementing solutions, such as building overpasses for migrating pronghorns in Wyoming and underpasses for panthers in Florida, to protect vulnerable wildlife populations. Now, Texas is looking for its own solutions, with projects underway across the state to help brown pelicans, ocelots, bats, pronghorns, fish and a host of other species affected by roads. The most visible effect of roads on wildlife comes from the toll of animals hit by cars. Vehicle-wildlife collisions kill millions of animals each year. That’s a lot of dead armadillos. The cost associated with vehicle-animal collisions is estimated to be $8.3 billion a year in the U.S.
Chris Schalk, a professor at Stephen F. Austin State University in Nacogdoches, finds roadkill pretty interesting. For one thing, roadkill can tell you a lot about wildlife movements — animal “hot spots” and “hot moments” and seasonal patterns. It’s data, scientific data. A little bloody, maybe, but data nevertheless. To find out more about Texas roadkill, Schalk started the Roadkills of Texas Project on iNaturalist earlier this year, in which citizen scientists can report roadkill sightings across the state. Understanding animal behavior is key. Salamanders move en masse every spring from forests to wetlands to lay eggs and sometimes cross a road to get there, creating a temporary wildlife-road interaction — what Schalk calls a “hot moment” — that needs addressing. Some wild cats might prefer to travel under a road in an underpass, seeking the safety of cover, while moose and elk might prefer to go over a road on an overpass, keeping an eye out for predators. In a deadly 10-month stretch in 2015-2016, seven ocelots were killed by cars in South Texas. For a population estimated to number only 80 to 100 individuals in Texas, the deaths were a cruel blow. Federal biologists decided something more needed to be done to protect the endangered creatures, whose main threats are road mortality and loss of thornscrub habitat. 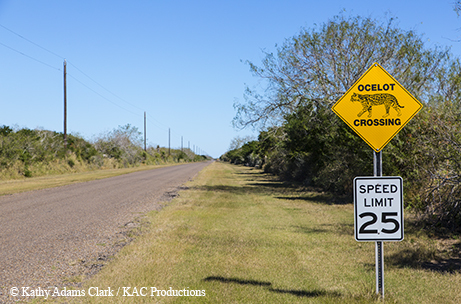 In Texas' first major effort to install wildlife crossings, TxDOT agreed to build 15 wildlife underpasses around Laguna Atascosa National Wildlife Refuge, home of the ocelot. The crossings on Texas Highway 100 were completed in 2017; construction is continuing on several of the others around the refuge. The crossings look like basic concrete culverts under the road. They may prove to be lifesavers. Wildlife crossings have proved to be successful in other areas. Vegetated wildlife overpasses in Montana have reduced vehicle-wildlife collisions in those areas by 80 percent. Florida panther road deaths dropped 90 percent after special underpasses were installed to facilitate their movement. Robin Gelston, TxDOT biologist for its South Texas district, says it may take a few years for ocelots to start using the crossings. But other animals are starting to use them, such as bobcats, coyotes, raccoons, tortoises and snakes. TxDOT also installed fencing, a key component of effective wildlife crossings, along Highway 100 to funnel animals toward the crossings. John Young, TxDOT biologist and former TPWD mammalogist who has worked on ocelot issues for years, says money is often a limiting factor. South Texas attracts winter-weary Americans with its abundant sunshine and warm temperatures. But it does get cold there, with winter fronts bringing sudden drops in temperature and bitter winds. That’s when trouble starts for a certain group of brown pelicans. After the pelicans feed in the Gulf of Mexico, they come home to roost in the evening on islands in the Bahia Grande, a large wetland east of Brownsville. When there’s a strong north wind and the pelicans are flying in, they hit a zone of turbulence over Texas Highway 48 and fall onto the roadway. Drivers have little time to react. Dozens of pelicans died last year after being struck by cars. TxDOT has conducted wind tunnel studies to see why the roadway causes the troubling turbulence and to determine what it can do to change the road design. In the meantime, a group of citizens has stepped in to protect the pelicans. They mobilize during winter storms to scoop fallen pelicans from the roadway. Roads affect aquatic creatures, too. When an energy company built a bridge across the Double Mountain Fork of the Brazos River, the bridge’s culverts limited the movement of fish up and down the river. That stretch of river contains the last remaining populations of the sharpnose shiner and smalleye shiner, two species of migratory prairie minnows listed as federally endangered. The minnows, with a unique reproductive life cycle, depend on a free-flowing river to migrate and spawn. TPWD worked with the U.S. Fish and Wildlife Service and others to remove the bridge in 2016 and restore habitat connectivity for the fish. What TPWD can achieve for minnows, Shawn Gray hopes to achieve for pronghorns. Gray, the TPWD pronghorn program leader, says roads act as barriers for pronghorns in West Texas. As a result, the animals are unable to move to different areas for mating and better grazing. After a historic decline of pronghorns on the Marfa Plateau from 2008 to 2011, TPWD started transferring animals from the Panhandle to bolster the population. Gray thinks better habitat connectivity would go a long way toward solving the pronghorn problem. Texas doesn’t have the large herds of migrating pronghorns that prompted other Western states to install wildlife overpasses, but the animals still need to move. Gray says moving existing fencing and installing pronghorn-friendly fencing will help, and he dreams of getting a pronghorn overpass built. He plans to start talking with TxDOT and ranchers to help Texas pronghorns safely cross the road. Most of the effects of roads on wildlife turn out to be negative. But there’s one group of animals that has found a way to make roads and bridges work to its advantage: bats. Bats discovered that concrete bridges with narrow crevices make perfect bat houses. In the early 1980s, bats started to move in to the Congress Avenue bridge in Austin after modifications were made to the bridge. After an initial panic, Austin residents learned to appreciate them, and now the bats, with their spectacular emergences against a skyline backdrop, are a top tourist attraction. After the Congress Avenue bats moved in, Bat Conservation International teamed up with TxDOT to conduct a statewide bats-in-bridges survey. They wanted to determine what bat species were using bridges, what bridge features made good roosts and how bats could be attracted to use new bridges or retrofitted bridges. The survey results became a blueprint for departments of transportation across the nation for the use of bridges as bat habitat. 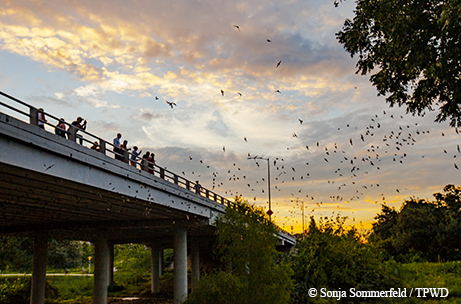 In Texas, at least 125 bridges are being used by 12 species of bats. Today’s problem with wildlife and roads grows from the legacy of a road system largely built before the rise of modern ecology. But there’s hope that things are changing. 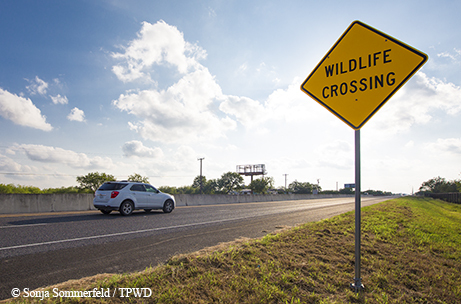 TxDOT has already made improvements in right-of-way management to support wildlife. It plants only native species along roadways and has made a major push to incorporate plants that support pollinators such as butterflies and bees.